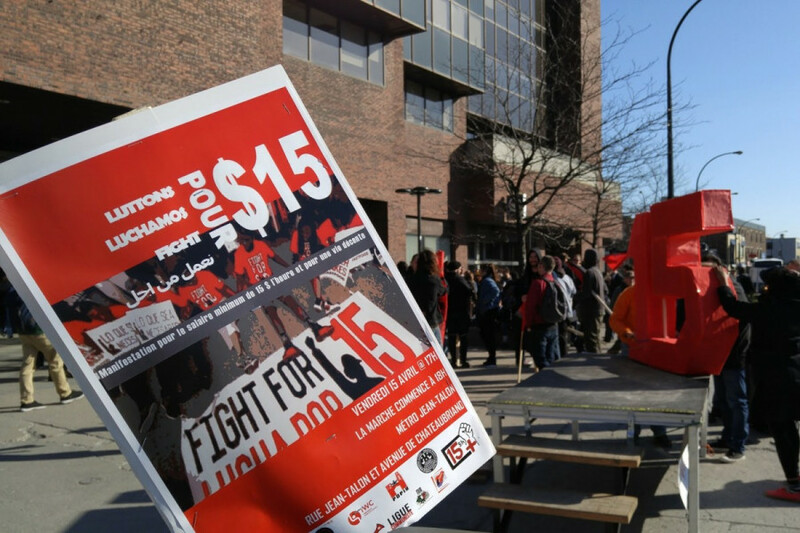 Around 250 people gathered outside the Jean-Talon metro station Friday evening for a demonstration supporting a $15-an-hour minimum wage in Quebec. The event was part of a two-day string of protests in North America under the #FightFor15 movement, which was started by American fast-food workers seeking a living wage in 2012. 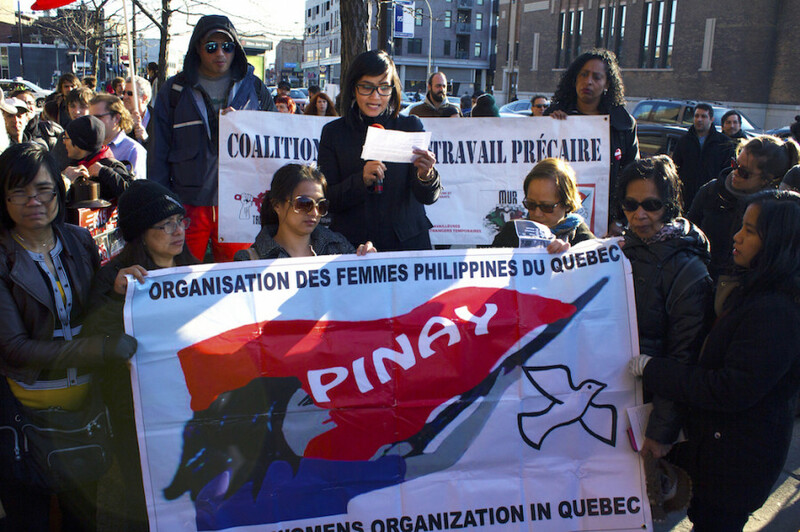 The Montreal demonstration was organized by a coalition of community organizations, unions and activist groups, including 15 & Fairness McGill, Industrial Workers of the World, and the Conseil central du Montréal métropolitain-CSN. Dominique Daigneault, president of the CCMM-CSN, told The Link that the fight for a $15 per hour minimum wage is an attempt to support the poorest workers in our society. 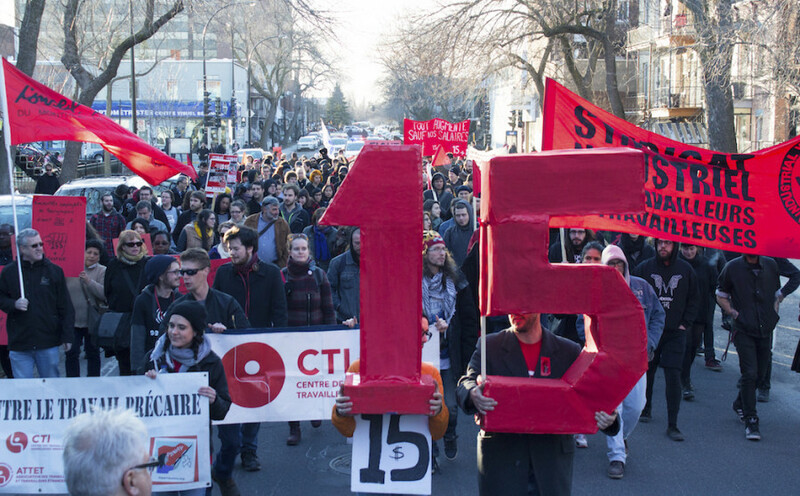 In a press release, the Montreal coalition supporting #FightFor15 argued that $15 per hour minimum wage is “a minimum and indispensable condition for a decent life.” The group decried the Quebec government’s minimum wage increase of 20 cents to $10.75 — effective May 1 — as being insufficient. At around 6:30 p.m., the assembled group took to the street for a planned march. Since organizers had provided an itinerary to police, the march was not declared illegal, and only six police officers on bikes were seen near the demonstration. 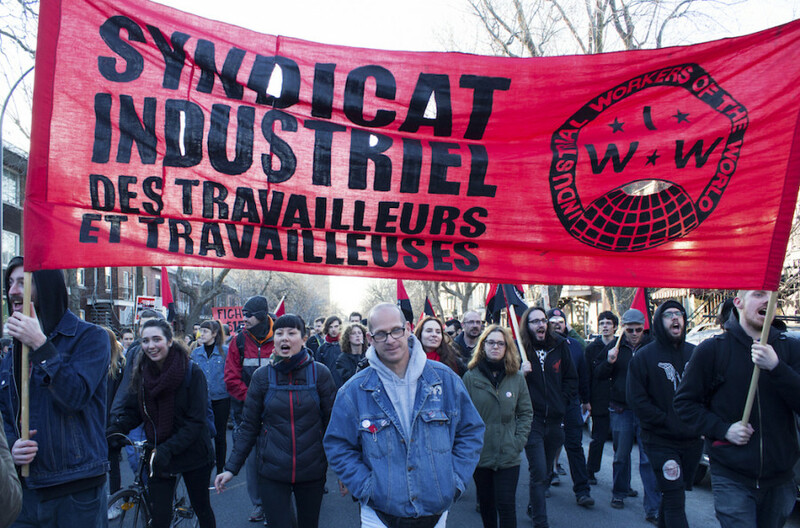 As the march passed down Saint Hubert St., members of the IWW were seen handing out flyers and engaging in discussions with bystanders on the issues of the minimum wage and poverty. The group marched for just under an hour, and returned to Jean-Talon metro, where they dispersed shortly thereafter. No incidents with police were reported.